Additional requirements for an enhanced Public Warning System (ePWS) have been agreed at the recent 3GPP TSG SA#79 meeting, as an update to Technical Specification (TS) 22.268. 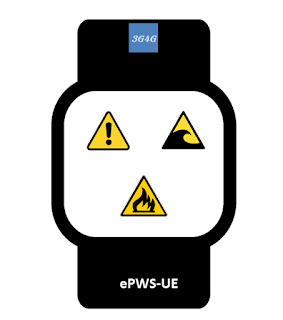 3GPP Public Warning Systems were first specified in Release 8, allowing for direct warnings to be sent to mobile users on conventional User Equipment (PWS-UE), capable of displaying a text-based and language-dependent Warning Notification. Since that time, there has been a growth in the number of mobile devices with little or no user interface - including wrist bands, sensors and cameras – many of which are not able to display Warning Notifications. The recent growth in the number of IoT devices - not used by human users – also highlights the need for an alternative to text based Warning Notifications. If those devices can be made aware of the type of incident (e.g. a fire or flood) in some other way than with a text message, then they may take preventive actions (e.g. lift go to ground floor automatically). Users who are not fluent in the language of the Warning Notifications. The work on ePWS in TS 22.268 (Release 16) is expected to help manufacturers of User Equipment meet any future regulatory requirements dedicated to such products. In the recently concluded 3GPP CT-50 in Istanbul, EU-Alert was adopted as part of Rel-11. The EU-Alert is introduced under Public Warning System (PWS) in parallel with Earthquake and Tsunami Warning System (ETWS). PWS was introduced in Rel-9 and I blogged about it here. ETWS has been around since Rel-8 and was blogged here. In fact EU-Alert is sent as part of the Cell Broadcast Message (CBS) using new identifiers. For more details see 3GPP TS 23.401. The following is an old video from CHORIST project, which was instrumental in providing details of working of this EU-Alert system. Also Read: Commercial Mobile Alert System (CMAS) here. I have blogged about Public Warning System and covered CMAS as part of that earlier. In response to the Warning, Alert, and Response Network (WARN) Act passed by Congress in 2006, the Federal Communications Commission (FCC) established the Commercial Mobile Alert Service (CMAS) to allow wireless service providers who choose to participate, to send emergency alerts as text messages to their users who have CMAS capable handsets. The FCC established a Commercial Mobile Service Alert Advisory Committee (CMSAAC) for the development of a set of recommendations for the support of CMAS. The CMSAAC recommendations were included as the CMAS Architecture and Requirements document in the FCC Notice of Proposed Rule Making (NPRM) which was issued in December 2007. In 2008, the FCC issued three separate Report and Order documents detailing rules (47 Code of Federal Regulations [CFR] Part 10) for CMAS. The FCC CMAS First Report and Order specifies the rules and architecture for CMAS. The FCC CMAS Second Report and Order establishes CMAS testing requirements and describes the optional capability for Noncommercial Educational (NCE) and public broadcast television stations distribute geo-targeted CMAS alerts. The FCC CMAS Third Report and Order defined the CMAS timeline, subscriber notification requirements for CMSPs, procedures for CMSP participation elections and the rules for subscriber opt-out. The FCC also issued a CMAS Reconsideration and Erratum document. 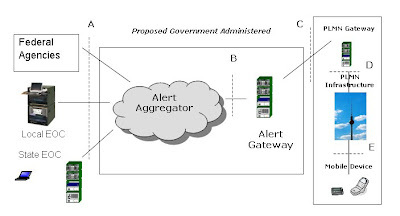 The CMAS network will allow the Federal Emergency Management Agency (FEMA), to accept and aggregate alerts from the President of the United States, the National Weather Service (NWS), and state and local emergency operations centers, and then send the alerts over a secure interface to participating commercial mobile service providers (CMSPs). These participating CMSPs will then distribute the alerts to their users. between the issuance of the second and third Report & Order documents. As defined in the FCC CMAS Third Report and Order, CMSPs that voluntarily choose to participate in CMAS must begin an 18 month period of development, testing and deployment of the CMAS no later than 10 months from the date that the Government Interface Design specifications available. On December 7, 2009, the CMAS timeline of the FCC CMAS Third Report and Order was initiated with the announcement by FEMA and the FCC that the Joint ATIS/TIA CMAS Federal Alert GW to CMSP GW Interface Specification (J-STD-101) has been adopted as the Government Interface Design specification referenced in the FCC CMAS Third Report and Order. Participating CMSPs must be able to target alerts to individual counties and ensure that alerts reach customers roaming outside a provider’s service area. Participating CMSPs must also transmit alerts with a dedicated vibration cadence and audio attention signal. Emergency alerts will not interrupt calls in progress. CMAS supports only English text-based alert messages with a maximum displayable message size of 90 English characters. The subscribers of participating CMSPs may opt out of receiving Imminent Threat and Child Abduction/AMBER alerts, but cannot opt out from Presidential Alerts. Reference Point C is the secure interface between the Federal Alert GW and the Commercial Mobile Service Provider (CMSP) GW. The Reference Point C interface supports delivery of new, updated or canceled wireless alert messages, and supports periodic testing of the interface. This interface is defined in the J-STD-101, the Joint ATIS/TIA CMAS Federal Alert GW to CMSP GW Interface Specification. Federal Government entity (i.e. FEMA) responsible for the administration of the Federal Alert GW. FEMA will perform the function of aggregating all state, local, and federal alerts and will provide one logical interface to each CMSP who elects to support CMAS alerts. For GSM and UMTS systems, wireless alert messages that are received by CMSP GWs will be transmitted to targeted coverage areas using GSM-UMTS Cell Broadcast Service (CBS). The CMAS functionality does not require modifications to the 3GPP-defined Cell Broadcast Service. The ATIS WTSC-G3GSN Subcommittee is developing the CMAS via GSM-UMTS Cell Broadcast Service Specification. The purpose of this standard is to describe the use of the GSM-UMTS Cell Broadcast Service for the broadcast of CMAS messages. 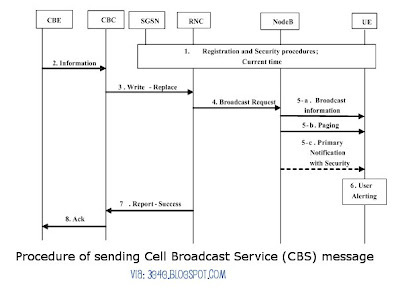 The standard includes the mapping of CMAS application level messages to the Cell Broadcast Service message structure. The ATIS WTSC-G3GSN Subcommittee is developing the Cell Broadcast Entity (CBE) to Cell Broadcast Center (CBC) Interface Specification. The purpose of this standard is to define a standard XML based interface to the Cell Broadcast Center (CBC). The CMSP Alert GW will utilize this interface to provide the CMAS Alert message information to the CBC for broadcast via CBS. The ATIS WTSC-G3GSN Subcommittee has developed the Implementation Guidelines and Best Practices for GSM/UMTS Cell Broadcast Service Specification and this specification was approved in October 2009. The purpose of this specification is to describe implementation guidelines and best practices related to GSM/UMTS Cell Broadcast Service regardless of the application using CBS. This specification is not intended to describe an end-to-end Cell Broadcast architecture, but includes clarifications to the existing 3GPP CBS standards as well as “best practices” for implementation of the 3GPP standards. CMAS is an example of an application that uses CBS. J-STD-100, Joint ATIS/TIA CMAS Mobile Device Behavior Specification, defines the common set of requirements for GSM, UMTS, and CDMA based mobile devices behavior whenever a CMAS alert message is received and processed. A common set of requirements will allow for a consistent user experience regardless of the associated wireless technology of the mobile device. Additionally, this common set of requirements will allow the various local, state, and Federal level government agencies to develop subscriber CMAS educational information that is independent of the wireless technology. In order to comply with FCC requirements for CMAS, CMSPs have a need for standards development to support CMAS over LTE/EPS as it relates to the network-user interface generally described as the “E-Interface” in the CMAS Reference Architecture. The intent of ATIS WTSC-G3GSN is to build upon LTE text broadcast capabilities currently being specified by 3GPP for the Public Warning System (PWS). 3GPP TS 22.268. Public Warning System (PWS) Requirements, covers the core requirements for the PWS and covers additional subsystem requirements for the Earthquake and Tsunami Warning System (ETWS) and for CMAS. TS 22.268 specifies general requirements for the broadcast of Warning Notifications to broadcast to a Notification Area that is based on the geographical information as specified by the Warning Notification Provider. This specification also defines specific CMAS requirements based on the three Reports & Orders issued to date by the FCC. 3GPP TS 23.401. GPRS enhancements for E-UTRAN access, specifies the Warning System Architecture for 3GPP accesses and the reference point between the Cell Broadcast Center (CBC) and Mobility Management Entity (MME) for warning message delivery and control functions. This TS identifies the MME functions for warning message transfer (including selection of appropriate eNodeB), and provides Stage 2 information flows for warning message delivery and warning message cancel. The architecture and warning message delivery and control functions support CMAS. 3GPP TS 29.168. 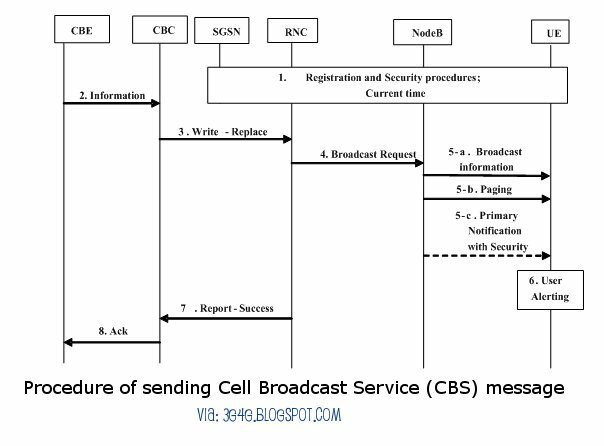 Cell Broadcast Center interfaces with the EPC – Stage 3, specifies the procedures and application protocol between the Cell Broadcast center and the MME for Warning Message Transmission, including the messages, information elements and procedures needed to support CMAS. 3GPP TS 36.300. E-UTRA and E-UTRAN – Overall description – Stage 2, specifies the signaling procedures for the transfer of warning messages from the MME to the eNodeB. The signaling procedures support CMAS operations. 3GPP TS 36.331. E-UTRA Radio Resource Control (RRC) – Protocol specification, specifies the radio resource control protocol for UE-to-E-UTRAN radio interface and describes CMAS notification and warning message transfer. 3GPP TS 36.413. E-UTRAN – S1 Application Protocol (S1AP), specifies the E-UTRAN radio network layer signaling protocol between the MME and eNodeB, and describes the warning message transfer needed for CMAS. 3GPP participants are working to complete these specifications and other UE procedures for supporting PWS and CMAS. ATIS WTSC-G3GSN will develop a Standard for a CMAS via LTE Broadcast Capability Specification. This Standard will map the CMAS application level messages to the LTE warning message transfer protocol (i.e. for CMAS). This ATIS WTSC-G3GSN effort has an anticipated completion date of December 31, 2010. This takes into account the time needed for completion of the ongoing 3GPP standards development on warning message broadcast for LTE. ATIS WTSC G3GSN and TIA TR45.8 Subcommittees in conjunction with FEMA will also be jointly developing a testing certification specification for the Reference Point C interface between the Federal Alert GW and the CMSP GW based upon the requirements defined in J-STD-101. This specification has an anticipated completion date of December 31, 2010. Public Warning System (PWS) is generalization of Earthquake and Tsunami Warning System (ETWS). The requirements for PWS has been defined in 3GPP Release 9 in 3GPP TS 22.268. 3GPP TR 22.968 details the Study for requirements for a Public Warning System (PWS) service. - PWS shall be able to broadcast Warning Notifications to multiple users simultaneously with no acknowledgement required. - Warning Notifications shall be broadcast to a Notification Area which is based on the geographical information as specified by the Warning Notification Provider. 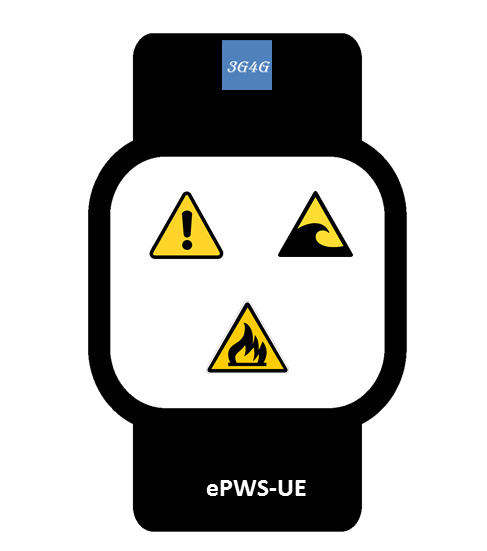 - PWS capable UEs (PWS-UE) in idle mode shall be capable of receiving broadcasted Warning Notifications. - PWS shall only be required to broadcast Warning Notifications in languages as prescribed by regulatory requirements. - Warning Notifications are processed by PWS on a first in, first out basis, subject to regulatory requirements. - Reception and presentation of Warning Notifications to the user shall not pre-empt an active voice or data session. - Warning Notifications shall be limited to those emergencies where life or property is at imminent risk, and some responsive action should be taken. Commercial Mobile Alert System (CMAS) is Public Warning System (PWS) that delivers Warning Notifications provided by Warning Notification Providers to CMAS capable PWS-UEs. CMAS defines three different classes of Warning Notifications (Presidential, Imminent Threat and Child Abduction Emergency). The CMAS functionality does not require modifications to the 3GPP-defined cell broadcast functionality.